SMDS recently moved into a new building shared with St. Margaret's Church. All faucets and toilets are low-flow fixtures. Students have been educated on the benefits of timed faucets and enthusiastically adjust their behaviors to match our water saving goals. 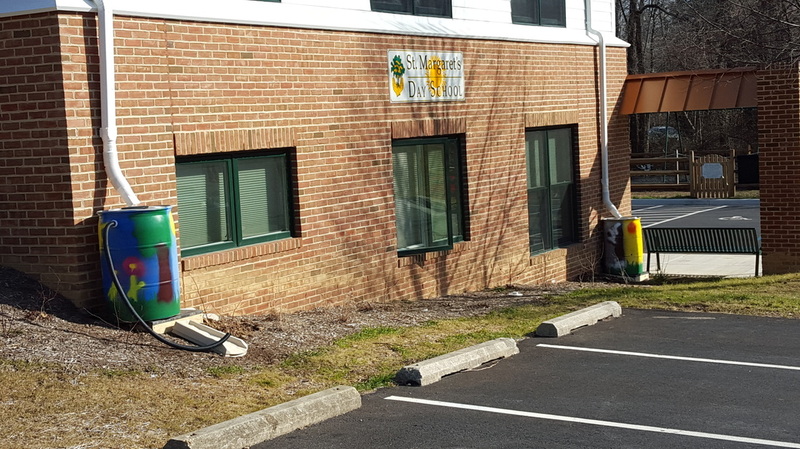 Part of the 2014-2015 St. Margaret's expansion included the conversion of a side lot into a rain garden. Additionally, next to the new building where new parking spots were added, a water treatment and bio-retention pond were added to collect and minimize the effects of runoff. Native plants were added to the rain garden and grasses were planted in the pond to filter the water and to build habitat areas for wildlife near the school grounds. In the photos above, Environmental Specialist Gail Morton teaches our kindergarten students how water runoff is effectively captured and how the plants can benefit from this process, while reducing or eliminating the need to use additional water. They were also able to see a demonstration of erosion control in action. This lesson was conducted in 2016, shortly after the rain garden was completed. 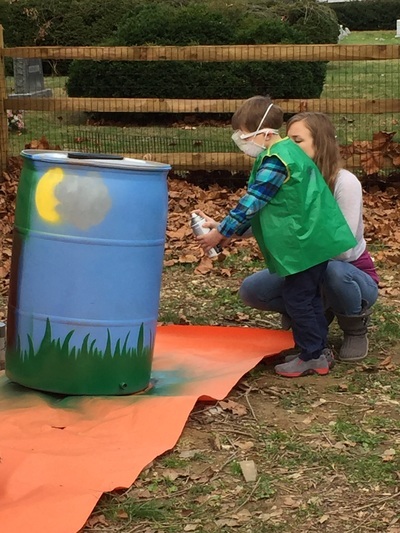 SMDS students helped paint the two rain barrels in the front of our building to join the many others in use around the St. Margaret's grounds. The students will use the water to help grow our gardens and native plants. The barrels were completed and placed in 2016. SMDS has enjoyed several harvests from its first two aquaponics tanks in the two-and-three-year rooms. The tanks house betta fish and have been growing wheatgrass and radish sprouts, though both the students and teachers are excited to see what other plants they can grow in their tanks. The tanks were initially set up in January 2016 and grow a new batch of seeds each month. In the photo above taken in January 2016, one of our Pre-K students helps to set up a tank.